Step out of the office, back in time and into the river. As recently featured on BBC Country File Spring 2016. Please browse our site and let us show you a part of Berwick upon Tweed history which has remained constant throughout the ages. Visit us on the river on which the town was established, and embrace the heritage of 900 years and thousands of working fishermen connected to wild salmon fishing. There is now an opportunity to experience true fishing heritage and become a crew member for a day. The freshest of fish for that evening supper at a local restaurant prepared especially for you. 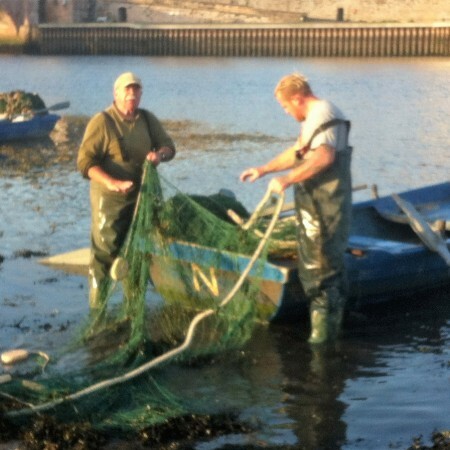 Located in one of the oldest existing fisheries in the UK, learn about over 900 years of Salmon fishing on the Tweed. The River Tweed Wild Salmon Co is committed to sustainabilily and the preservation in this unique location. 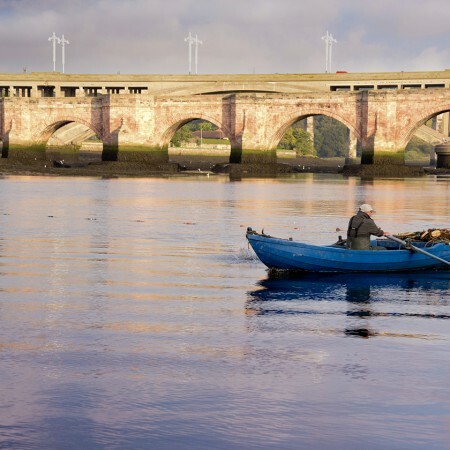 Based in Berwick Upon Tweed, a historic walled town famed for it’s turbulent past, the River Tweed Wild Salmon Co still maintain and preserve the traditional skills of salmon fishing using Net & Coble which have remained largely unchanged for over 900 years. Discover the story of this amazing tradition first hand with one of our experience days. The recent Scottish Wild Fisheries Review by the Scottish Government has deemed The River Tweed to be a Grade 1 river. This means that the wild fish stocks of salmon and sea trout are healthy and sustainable, therefore, under the guidance of the Scottish Government a harvestable surplus can be taken from the river. These conservation measures are under constant review. The River Tweed Wild Salmon Company appreciates the importance of sustainability and delay the season start to help protect Spring stocks of salmon. Net fishing can legally start on April 1st but we usually delay our start as we are mindful of fish numbers in the Spring . When we do start it is predominately for sea trout. The River Tweed Wild Salmon Company is the only commercial fishery left on the River Tweed and is therefore the only route to market for Tweed wild salmon and sea trout as it is illegal to sell rod caught fish. We tag and record each fish caught to ensure traceability and providence. This gives our customers the reassurance of origin and guarantees the highest of quality every time. Each session lasts approximately 5 hours. Morning, afternoon and evening sessions are all available throughout the season.